Primer waters appear to be new primer thing in the beauty industry. I was intrigued by the whole idea of a water being able to act in the same way as cream primer. Many of the primer waters on the market claim to be water pumped full of vitamins that make the perfect base for makeup. My first thoughts, how can a hyped up water be that good!? I have 3 that I've been putting to the test. When Smashbox launched their primer water, I was very intrigued to see what these waters have to offer, over conventional primers. Smashbox water claims to add hydration, radiance and the priming benefits in one easy spritz. One thing to note is this doesn't contain Silicone, so if you like silicone primers, that's something to be aware of. This is also packed with multi vitamins for added skin care benefits. Smashbox highlight that this packs a punch in terms of hydration, and maintain hydration throughout the day. This can also be used as a setting spray to keep makeup in place throughout the day. This is super easy and convient to use. Just spritz on and your ready for makeup application. The mist is nice and fine to. Once it has dried it doesn't feel like this is anything on the skin. Which is good for those who don't like the feel or idea of adding an extra layer of product to the skin. And my skin did feel pretty smooth. My biggest thing I look for in primers is whether they will stop my makeup drying out on my skin. So I was apprehensive of how this lightweight primer would hold up and it did pretty well. My favourite foundation lasted all day without any drying or feeling tight. In terms of radiance, it wasn't as radiant as my favourite primers but my skin didn't look dull. Freedom are knocking the ball out the park with their dupes at the moment. If you read my Battle of the Glow Tonics they featured in there too. 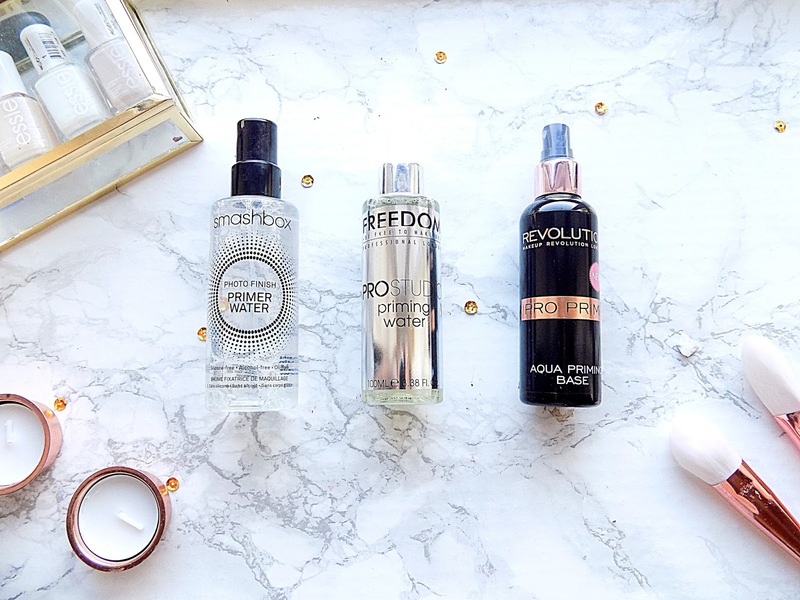 There Priming water promises to do pretty much the same thing as the more expensive Smashbox one; Hydration, a lightweight formula and add radiance. Although this one does contain Alcohol, the Smashbox doesn't. This held up the same way as Smash box one to. It felt lightweight, fast asboring, stopped my foundation drying and left my skin feeling smooth. With Makeup Revolution being the sister brand to Freedom, I thought these would do pretty much the same thing. They claim to do the same thing. Although this one has a really over powering flowal smell. That in my opinion doesn't smell nice. Although I didn't find this as smoothing as the other 2. But it was lightweight and fast absorbing. Overall, I'm not completely sold on the whole primer water thing. I mean, don't get me wrong I really like them, but do they work as well as your traditional primers? I think all depends on what you want out of your primer. For me, I want a primer to give a glow, hydration and smooth my skin over. And none of these gave me a glow that my current favourite Becca primer does. In terms of convenience they are a lot easier to use and are nice and refreshing. Plus theres the whole added skin benefits they offer. primer water are great alterative for those who don't like feel of primers or don't like the idea of adding in an extra step to the makeup process. If primer waters are for you the Freedom one is a great option, it does the same thing as the Smashbox offering at less than half the price, and doesn't have an offensive smell! What are your thoughts on primers waters? Have you tried any of these?